It was cold, damp and rainy on Saturday...so miserable out that sis decided to stay at home and get over her sinus infection. We have such a grand time running around that normally I would have hung around the house but I find that when the weather is rainy,that is the best kind of day for finding treasure or at least it is for me. Perhaps it is the fate of a Sea Witch to thrive in a water soaked day so I was off to a few favorite haunts and they did not disappoint. Fantastic Warwick china Pitcher and Bowl set. Nice late Victorian piece and I adore these in white. Lovely sterling mirror and brush set from the 1900s, a lovely gold mirror, brush and comb set from the 1950s, a pretty mirror dresser tray with roses along the edge, a cool, vintage iron from the 1950s, and the loveliest little tea pot from the 30s. I may keep that myself. How cool is that huge, calabash pipe and then right next to is is a tiny wooden shoe pipe. Both vintage and still working. Pretty little Victorian basket, nice pink darner, a rhinestone pin that spells out Paris, a pair of sterling dinner table bells and a vintage 38 special cap gun. Pretty vintage photograph in tin frame, lovely dresser set of a powder box and a pair of scent bottles, two books from the 1800's but the real find is a series of french missals and paper items. I immediately thought of all of those altered artists who adore working with vintage papers and thought how lovely it would be to have some of these sheets. As I looked at them I felt a "giveaway coming on". Yea, this would be a neat item to put in a giveaway and my honey always says to spread the wealth so look for tomorrow's post regarding this frenchie giveaway. After cleaning items up and preparing tags, I hauled my treasure to Queen of Hearts and put most of them in my booth. A quick rotation of stock to make the booth look fresh and I think we are good to go. Hope you enjoy the photos. The Victorian water and pitcher set look lovely with the purple tulips. Moved the silver into the corner cupboard and displayed the green depression glass and vintage china pieces. Pretty vintage travel case, and shabby cabbage roses on china. I love this pretty impressionistic painting in the vintage frame. I think the silver looks great in this vintage corner cupboard. Nice juxtaposition of elegance and comfortable home. Pink is such a fun color to decorate with. That's TWO, TWO, two mentions in one day. 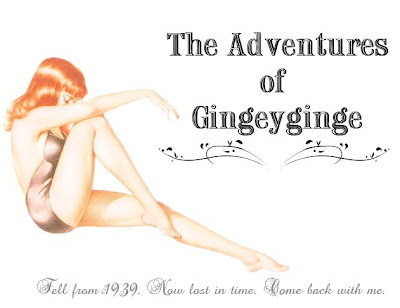 Let me start with The Adventures of Gingey Ginge, a visually faboosh blog devoted to pinups and entertainment icons. 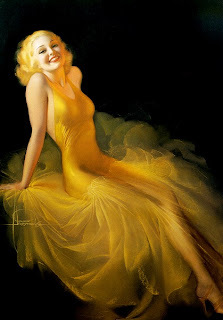 Gingey finds some of the most beautiful photos of the silver screen greats along with the most extensive array of pinup gals I have ever seen. I adore pinups old and new and Gingey has so many delightful pics and many I have not seen before. This is a visually feel good blog and if you have never visited Gingey's Adventures then you must do so. I had only recently discovered her blog and immediately sent her one of the pin-up brooches that I make and sell. If there was ever a woman who should have a pinup brooch it is Gingey. She very sweetly snapped her photo wearing the brooch and posted it on her blog today. Thank you Gingey for your sweet post. was ME! Yes, the Sea Witch. What a wonderful surprise to see that my blog was a "purrfect" way to spend a few minutes. I am flattered Domestic Witch and I thank you for your shout out. I adore "Goofus Glass." I love the heavy pressed glass feel and patterns, I love that you will almost always find it in some kind of chippy paint condition. I love that it is usually found with cabbage rose patterns and some of them really big and textural. I love that it comes in a variety of items and I love that you can usually find it at an affordable price. If you haunt thrift stores, antique shops, or do the yard sale shuffle, you have most likely come across this unique item and often passing it by. Goofus glass is pressed glass which was cold, unfired paint decorated in America by several prominent glass factories. It's production began in the 1900s and all but ended in the 1930s. It was made in considerable quantities and sold originally for very little. 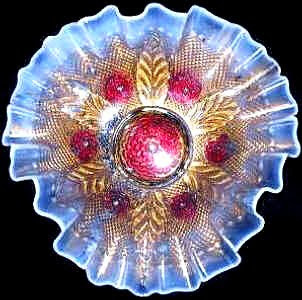 It was also given away as premiums for buying things, awarded as prizes at fairs, and was the first carnival glass preceding the iridized pieces known as carnival glass today. Goofus glass was not originally known as "Goofus." It most likely gained that name because the painted decoration wasn't very durable and people felt perhaps that it was "goofy" or that someone had tried to "goof - us". 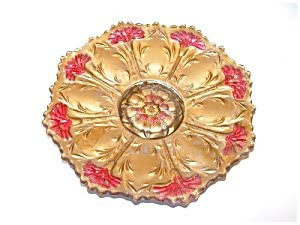 Produced in a myriad of colors, it is most often found in the brilliant, strawberry red, hits of brilliant green and the ubiquitous leaf gold paint background. I just like that it was utilized as prizes at local fairs and carnivals. (I have an affection for these unique public gatherings). This is the back of a piece of Goofus glass. You can see how the cold paint has chipped away from the foot of the bowl. You must be careful when cleaning Goofus as it is often found quite dirty and dusty. I always use a soft, warm and damp wash cloth with a little Ivory Dishing liquid and carefully clean it that way. I then allow it to air dry. (Ivory is not a detergent and is extremely gentle on fiber so it makes it a perfect cleaning product for most antique pieces. It is the only thing I use to hand wash wash vintage whites as well as fleece and wool items as it leaves no residue and does not harm the fiber or diminish the color) Never, ever utilize a cleaning spray or put Goofus glass in your dishwasher...those products or appliances will completely remove the cold paint which makes Goofus so "goofus". There is a wonderful website for learning about Goofus glass and the many items produced as well as what is "NOT" Goofus glass. It is called the Goofus Glass Museum . A wonderful source for all things Goofus, below are a few examples of the many faces of Goofus glass from that website. 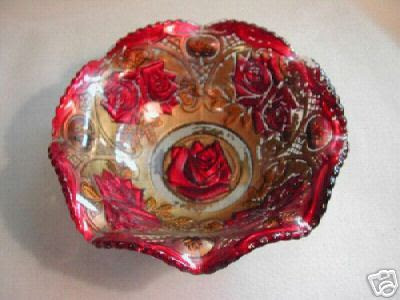 Wonderful full, cabbage roses covered powder dish. 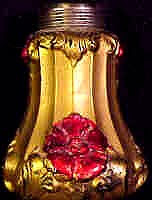 Beautiful Gone with the Wind Lamp. I have only seen one of these and they are extraordinary. Can't you just see this on a parlor table at Christmas? The definitive flower vase. You can find these often without their paint and usually a sun purple. Wonderfully shabby. Pretty plate. These can be found easily and usually around $12.00. 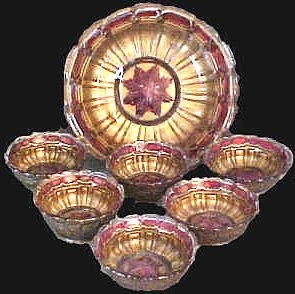 Great berry and bowl serving set. I have been fortunate enough to find several of the opalescent Goofus glass offerings. They are lovely to see and the opalescent really enhances the gold leaf cold paint. These are in the pricier range ($60.00-75.00) but so worth it. 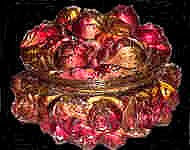 An ornamental circlet or head covering, often made of precious metal set with jewels and worn as a symbol of sovereignty. 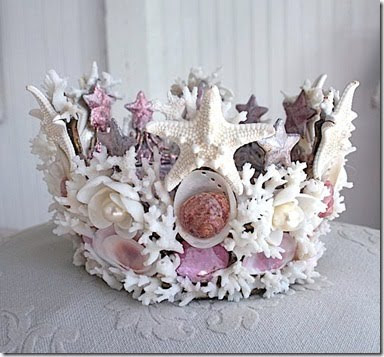 Or if you are a mermaid or a "sea witch" you would want to wear this symbol of sovereignty, this lovely crown fashioned from the gifts of the sea. 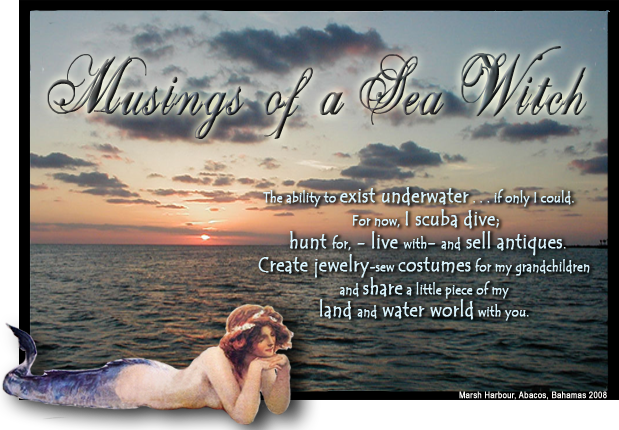 It is my passion, one day, to create such a crown fitting a woman of the sea. 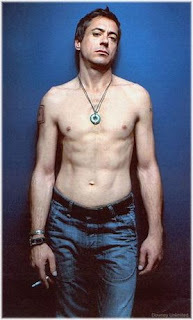 Until I do begin this artistic quest, I will look to this amazing piece for inspiration. This was created by Sherry Litchfield of http://sherrysshellabrations.com/crowns.html. Her work is lovely and she will do custom work from furniture to "shell phones". Hello friends. I am so excited about my display case at Queen of Hearts. (I know, I know, I get excited about the smallest things...but for me it is these simple things in life that set me dancing) I spent most of this damp and rainy Saturday setting it up and of course, adding a few more items to my booth as long as I was there. The case is packed to the gills but I still have a few things I would like to do to it. The back of the doors are black and with no lighting in that immediate area, I have to maximize whatever light I can find. So I will put a pale, vintage wallpaper on the back of the doors next week.This will lighten up the case a bit and make it easier for folks to see what is inside. My case as you walk through the right main entrance. 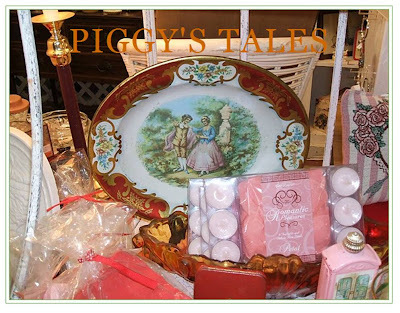 Pretty vintage figurines and jewelry. Fantastic pair of vintage Dior Noir cats eye sunglasses. These are uber FAB. I adore vintage rhinestone jewelry. They have such sparkle and fire. Interesting items to appeal to all kinds of collectors. This woman's Art Nouveau flask with collapsible cup/top is a personal favorite. Pretty Austrian crystal drip necklace and a fantastic vintage lucite box purse. Yes, you will be the "Queen of the Rodeo" with this smashing rhinestone rodeo queen tiara. Perfect for the western bride as well. My honey's film Sea Reef underwater camera outfit. He has upgrade to a new one so it's time to pass this one on to another snorkeler or diver. Wonderful vintage bells, antique ice cream scoops and a frozen Charlie. I also adore crystal knife rests from the Victorian era. These are lovely and two are master rests. Some pretty items to entice shoppers to my case. This magnificent Sail Fish is Italian glass. 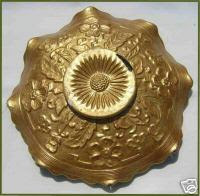 It stands about 16 inches high and is a real eye catcher. With Mardi Gras just around the corner, I thought these gals looks sweet on the case. Took a couple of shots of my booth as I am now adding more for Valentines Day, St. Paddy's and spring in general. This is a fantastic item of natural hair color swatches from France. Used by a hair salon. Very 1950s. I found two lovely Williamsburg reproduction chandeliers two weekends ago and have them lit in my booth. They look so good that I almost want to redecorate my home just around these lighting fixtures. Well made and waiting for a new home. As I age, I find that January seems to fly by faster each year. I always look forward to the new year and January is usually a month of "new beginnings" for me. Instead, I feel like I am playing catch up from December and I have been so busy at work that I have not posted in 5 days. I must not let the current of life carry me downstream to fast...at least not without being part of the view. So, first let me wish "Blessings" to everyone who stops by and to those they care about. Some happy news for me. I have wanted to rent one of the glass cases at Queen of Hearts since September of last year and have been on a waiting list for a particular corner case. 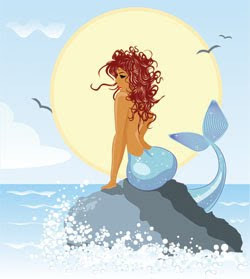 Just learned that the case is mine so I'm like a manic mermaid pricing items to display in this wonderful case. Pictures will be taken over the weekend and showcased in a future posting. 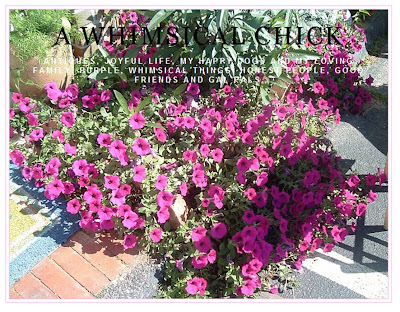 These are terrific women, multi talented, and new to blogging and they are anxious to meet this wonderful community that I so enjoy and talk about often. Next on my "hit list" is to transfer all inventory data to a new excel setup. I have been using Access for my inventory for years but have found that it is more program then what I ended up using so I have revamped the way I want to use the inventory data and wanted to transfer it all over to the new excel format I created. Spent the last 5 days creating and moving the data and it is finally complete. I LOVE IT. (I know, I know, I can get excited about the simplest of things). This will make my inventory management much easier and I like how quickly the data changes with the quick click of an assigned filter. Magic is what it is...Magic. Tackled the garage this weekend. 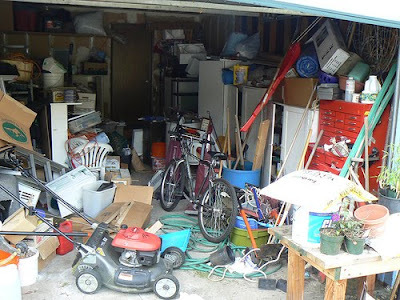 Although this is one messy garage, this is NOT mine. Mostly, I just needed to rearrange all of the holiday items that I brought back from my booth. I like to put it in order so next year I can find it quickly. With freezing temps the last few weeks, it was just too cold to get in there but Monday was a sunny day so I got busy. Gotta get back to the pool too. I'm missing my water aerobics and a mermaid out of water is never truly happy. 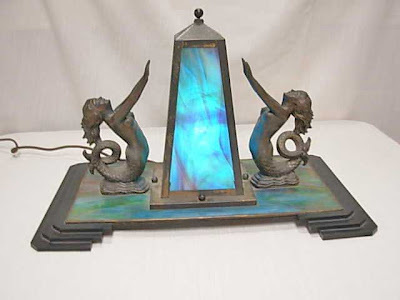 Speaking of mermaids, how cool is this Art Deco lamp. I would love to have this marvelous piece. Crazy mad about the blue stained glass that leaves the color of tropical waters on the ladies of the sea. Monkey head and sheet music. "Project Runway" Returns to New York! BRRRRRR, this Sea Witch is freezing her tail off.